When I first became aware of the word “activism” it was usually in context of people who would go and protest at things. In fact, I used to shy away from the word activist, because I felt that I wasn’t a “real” one. So what if I recycled, and talked about environmental sustainability. I wasn’t out there with my signboards shouting and chanting and blocking traffic and getting arrested. However, years ago I was given a definition of the word “Power” as “The ability to take an action,” while I was in the leadership and ritual arts training program at Diana’s Grove. And the way I see activism, it’s not synonymous with protesting. Activism, much like power, is taking an action. It’s standing up, speaking up. And that sounds so simple, and it’s not. This entry was posted in Uncategorized on August 27, 2012 by shaunaaura. Like everyone else, I am saddened and appalled by the spate of violent shootings in the last month. Although we don’t know all the details yet about these occurrences, initial reports indicate that the lax gun laws in this country contributed to worsening the impact of these incidents, particularly the shooting in Aurora, Colorado where multiple weapons were used, including an assault weapon with an extremely high-capacity magazine. Activism against gun violence is an uphill battle. Pro-gun organizations, especially the NRA, use scare tactics to generate huge amounts of financial support which they use with great effect to make legislators afraid of supporting even modest improvements in laws to close loopholes or remove military-style assault weapons from civilian markets. This has been done in the past: from 1994 to 2004 a federal law banned the manufacture of certain kinds of assault weapons and high-capacity magazines. If that law had not been allowed to expire, it is very likely that the shootings in Tucson, Arizona and Aurora, Colorado would not have had such a high toll of wounded and injured. In particular, the shooter in Tucson was wrestled to the ground by citizens when he stopped to reload. If he had had to stop to reload sooner, fewer people would have been hurt. Senator Frank Lautenberg of New Jersey introduced a bill that would ban high-capacity magazines. I urge you all to write or call your legislators – especially your senators – to urge them to support Sen. Lautenberg’s bill. Ask them to cosponsor it and to pledge to work to make sure that it reaches the floor for a vote. If you want to get more involved, the Brady Campaign to Prevent Gun Violence is a well-respected institution that has played a key role in advocating for responsible, common-sense legislation that works to reduce gun violence without limiting the rights of law-abiding civilians to keep and use weapons for legitimate purposes. Mayors Against Illegal Guns is also a strong organization that pushes for reasonable restrictions. Check out these sites and at least educate yourself. Limiting high-capacity magazines is only one step. Another critical problem is the gun-show loophole which allows anyone to buy weapons from unlicensed dealers without a background check. This loophole was what allowed the shooters at Columbine to acquire the weapons they used. An overwhelming majority of both NRA members and gun owners who are not NRA members support closing this loophole, yet Congress continues not to act. We desperately need to convince our legislators that they have the support of their constituents in taking these common-sense steps to reduce gun violence. This entry was posted in Uncategorized and tagged gun violence, legislators on August 19, 2012 by Literata. I was originally going to write a bit today about what Paganism can bring to the Interfaith table. But, considering recent events, I’ve decided to postpone that article until next time. It has been a week since the shooting at the Oak Creek, Wisconsin Sikh gurdwara. It has been six days since a fire destroyed the mosque for the Islamic Society of Joplin, Missouri. In the first case, it’s quite clear that the Sikh congregation was targeted, but things in the latter are unclear. What we do know about that fire at that mosque, however, is that this was actually the second fire it suffered. The first, taking place on July 4th, was determined to be arson. While it doesn’t mean that this more recent, and far more destructive fire, was also deliberate, it does seem to necessitate some careful investigation in that direction. Considering the shooter in Wisconsin has been killed, we may never know his exact motivations for choosing the Sikh community to attack. His ties to white supremacy and membership in neo-Nazi bands seem to make it pretty clear that there was a racial component but we may never know if this specific gurdwara was chosen for a reason or if the shooter was simply seeking to harm the Other. The perpetrator of the original arson in Joplin has yet to be caught and the second fire is still being investigated, so we don’t have enough to work with there. However, I find it hard to accept the premise that someone not motivated by racial or religious bias would randomly choose to burn down a mosque. In the week since the shooting, we’ve heard a lot of talk of gun control. We’ve heard from world leaders about how horrible the event is and how we must mourn for those killed and injured. And, if like me, you sift through the comments on news and opinion sites, you’ve been exposed to some fairly heinous ideas as well as some noble thoughts. But what we haven’t heard too much about is what different religions have done to support each other. This map shows places where vigils for the shooting in Wisconsin were held throughout the US and a few in Canada. Jahnabi Barooah, assistant religion editor at the Huffington Post, provided a brief reflection of one such vigil in Manhattan. I read today that other religious communities within Joplin stepped up to provide Muslim members of their communities a place to hold an iftar on Wednesday, August 8. Involved were the South Joplin Christian Church, the United Hebrew Congregation, and others. It was held at St. Philip’s Episcopal Church as reported by the Council on American-Islamic Relations. Even members within our own Pagan community have stepped up; Circle Sanctuary, also located in Wisconsin, is collecting donations through August to raise funds for the families of the slain. The interfaith outreach performed in the wake of these horrible events helps to lift my spirits. The words of individuals throughout our nation as collected by the Groundswell Movement help me to realize that the actions of our most radical few do not define us. I see the work of people like Valarie Kaur, a Sikh woman; an award winning filmmaker; and interfaith organizer, who, according to her own twitter feed, has been on CNN, FOX, NPR, worked with the Christian Science Monitor, Boston Globe, and more since this past Sunday to help educate people about Sikhs and their religion. Lest you think it’s only the religious that have stepped up in the wake of these events, Chris Stedman, Assistant Chaplain and Values in Action Coordinator for the Humanist Community at Harvard University, has been vocal on twitter about his support of this Indiegogo campaign to rebuild the Joplin mosque which, when this was written, had blown past its goal and raised over $320,000. The Humanist Community itself is organizing a trip to a gudwara in Massachusetts both to participate in a service commemorating the victims of the shooting but also as an educational opportunity. As with many things in our lives, we are often motivated to act when something negative happens and drives us forward. I’m as guilty of this myself when I look back at some of my own attempts to organize parts of our Pagan community toward a goal. But, the work of these individuals to educate about the religious and non-religious diversity found in this country as well as the collective process of working together at the community level is a necessary and beautiful part of our future. Religious and philosophical beliefs often separate us. How, for example, do you find the common ground between an atheist and a theist or between a monotheist and a hard polytheist? And yet, we find over and over again within our communities that we have a drive to work together to learn about and try to understand the beliefs of others in a way that we seem to lack when it comes to other concepts like politics. I find this to be true within myself, too. I’m far more willing to sit down with someone and discuss what Catholicism (for example) means to them then why this informs their choice about this November’s election. To be honest, I’m not sure why this is. Perhaps because of the religious freedoms enshrined in our Bill of Rights we find it hard to completely discount the beliefs of others in the same way we can categorize and marginalize those who think differently from us in other ways. Regardless, the interfaith movement in this country provides a template for a way that we can begin to work together again. It is a template that organizations like the Interfaith Youth Core are beginning to define and one that I think can be generalized as a solution to work across other divides. Next time, as mentioned above … way above! this was a long post … I’ll be writing about why I think Pagans need to be involved in interfaith activism. But I’ll also be returning to the ideas at the end of this article about why interfaith seems to engender communication while other differences do not. This entry was posted in Uncategorized on August 12, 2012 by David Dashifen Kees. My gateway to protesting occurred when John Salvi walked into two abortion clinics in Brookline, Massachusetts and riddled the waiting rooms with bullets. Two weeks earlier I sat in the waiting room of one of those clinics to see if I was pregnant. Thankfully, I wasn’t. Prior to sitting in that waiting room I participated in smalls acts of progressive politics. The first is when I watched two young men shoplift condoms from the CVS I was working at. I walked up to them and told them to pay. Neither had any money so I let them go. Even at age 17 I was smart enough to know these young men — probably about 14 — should have condoms at their disposal. The second was to write a Letter to the Editor to my hometown newspaper supporting the distribution of condoms in the high school nurses office a few years after the shoplifting incident. 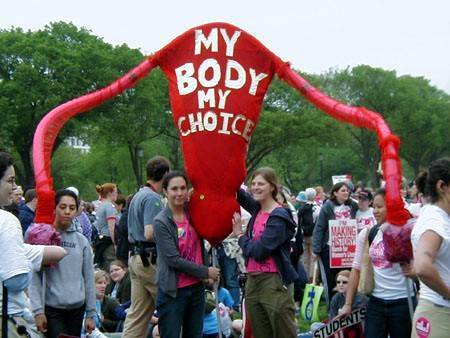 Reproductive rights still continue to be important to me though I don’t rally around them like I used to. At that time in my life, throughout my twenties, nothing frightened me more than an unwanted, unplanned, unprepared for pregnancy. The idea of being knocked up just terrified me and I did whatever I could so I would not be in a position in which I saw so many friends: pregnant, desperately wanting an abortion but having no money for one. I saw the men and women of Congress taking away my ability to make a choice so I was on those lines yelling and chanting, writing letters, and voting for the most pro-choice candidate available. Over the last decade my activism has turned to peace and nonviolence, climate change, organic food/farming, and economic equality (you know, living salaried, sustainable jobs). I feel most threatened by the increase in war and violence, changes to Mother Earth’s ecosystem based on greed (and sometimes stupidity), and the inability to find a job paying a living salary. This year has been a particularly busy year for me protest wise. I’ve been involved heavily with my local Occupy group which has connected me to the greater Occupy Movement. This connection allowed me to visit Chicago — where my “arrest cherry” was popped — and Burlington to bring awareness to two issues that are particularly important to me: bringing peace and nonviolence to the table as the most appropriate method of conflict resolution and moving from detrimental energy collection and distribution to sustainable methods of power. In September I will travel to NYC on September 17th to mark the one year anniversary of Occupy Wall Street and participate in some protests on things job and climate change related. Then in November I will travel to DC to Occupy the White House. And next year? I’ll recover from this year. This entry was posted in Uncategorized on August 5, 2012 by mcunha.